From 2008 through the end of 2017 I worked for Indiana University's Voices and Visions of Islam and Muslims from a Global Perspective. Originally funded by the Social Science Research Council's Islamic Traditions and Muslim Societies in World Contexts program, the project was designed to help build bridges between Muslims and non-Muslims via education, media, and art. As managing editor of Voices and Visions I helped create, and host, the Muslim Voices podcast, Muslim Voices videos, edit the Muslim Voices blog as well as organize several workshops and events. I also managed the Muslim Voices Twitter account, @muslimvoices, which has more than 115-thousand followers. From 2013-2015 I worked on Framing the Global. A project of Indiana University's Center for the Study of Global Change and Indiana University Press. Its goal is to reshape and rethink academic approaches to Global Studies. It also strives to make scholarship on globalization and global issues accessible to a broad audience. IU received five years of funding from the Andrew W. Mellon Foundation in order to bring this project to life. I served as the project's web editor and managed its Twitter account -- @FramingGlobal. Before re-entering academia, I worked in public broadcasting. First in Athens, Ohio in the WOUB newsroom and then in Birmingham, Alabama at WBHM FM. At WOUB I produced a longform TV series we called the "Election Roadshow" -- each story was an in-depth look at one particular issue. I also served as the Managing Editor of the nightly TV newscast and anchored radio newscasts as needed. 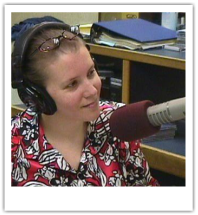 My heart has always been in radio, so when the chance to work full-time in that medium appeared, I jumped at it. I loved working in Birmingham. There were so many stories to tell (not to mention warm winters to enjoy). Although the small news staff was expected to cover a bit of everything, we were encouraged to create specialties for ourselves. I ended up carving a niche covering social issues and science/medical stories. My work on the science/medical beat helped me win the Alabama Associated Press's Best Specialized Reporter award two years in a row.